Nearly one-third of NYC high school students do not graduate after four years, according to the New York State Department of Education.1 Thousands more end up leaving the education system with no diploma at all. Because the vast majority of dropouts had a history of being overage and under-credited, reducing the city’s dropout rate requires focused support for this population. A key partner in this effort is Jobs for the Future (JFF), a nonprofit working in forty-one states to help struggling students graduate college-ready and succeed in college and to support low-skilled workers through career advancement. Starting in 2011, JFF teamed up with Eskolta to look at the experience of West Brooklyn Community High School (WBCHS), a transfer school operated by Good Shepherd Services in cooperation with the NYC Department of Education. WBCHS has demonstrated striking successes: students there earn credits, graduate, and pass state exams at an exceptional rate, achievements that are no small feat for a group that previously struggled to stay afloat in traditional public schools. To better understand what has contributed to the school’s exceptional track record, Michael Rothman and Ben Lorr of Eskolta engaged in a process of inquiry, observing classes and staff meetings, running focus groups, and interviewing staff to gather the firsthand experiences of the individuals who support WBCHS. They explored the structures, relationships, and core values contributing to the school’s tightly knit, supportive, and academically rigorous learning community. 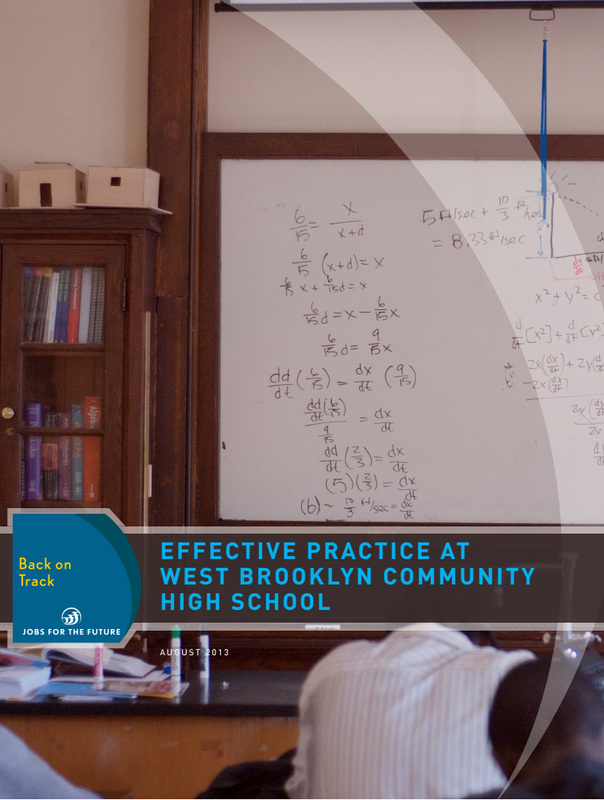 The observations that came out of this process were codified in an eleven-chapter book written by Eskolta and published by JFF, entitled Effective Practice at West Brooklyn Community High School. Since the report’s publication in the fall of 2013, JFF has begun using it to share lessons with other districts that are seeking to emulate the work that Eskolta studied in New York. Lili Allen, a program director on JFF’s Back on Track team explains, “It’s been very useful as a foundation for schools serving this population all over the country.” Allen has used sections of the report with schools in the Rio Grande Valley and Denver-area Intensive Pathways schools (similar to NYC’s transfer schools). What are some insights schools can learn from? “The way they think about key priorities…their model uses a nice balance of leadership and staff involvement. [The book] really lays out how the core principles are visible in school practices,” says Allen. These points and others will continue to be shared with educators across the country through JFF’s work in the near future.